There are more ways than one in making us say yes when we're courted by persistent suitors. Ways of men can be conservative, persuasive, sometimes cool and others were exaggerated. Having worked in a male dominated company in my first years of working exposed me to a lot of my friends' way of making their courtship successful. I actually find it funny sometimes as most of the guys in my work are my real friends and I know some of them are not serious. Though I must admit there are others who are sincere with their feelings. 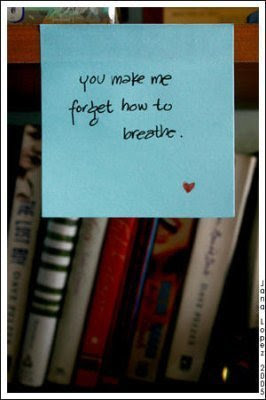 One statement that I found really funny are the words 'You make me forget how to breathe'. These are the words that my friend wanted to say to one girl in our group and the guy really feel it. He told me that he can't breathe whenever the girl is around lol! Lucky that the girl didn't say yes or else he'll forget to breathe when they're together hahaha!